These beautiful folding ‘The Lord of the Rings’ stamp booklets offer an introduction to J.R.R. Tolkien’s world of Middle Earth and features leading characters from Peter Jackson’s award winning ‘The Lord of the Rings’ motion picture trilogy. Inspired by both, they commemorate and explore Tolkien’s classic mythos in a form that film enthusiasts, stamp collectors, and fans will appreciate and enjoy. THESE COMPACT COMMEMORATIVE Stamp Booklets contain a varied selection of all six official self-adhesive stamps showing pictorial designs derived from scenes in the award winning ‘The Lord of the Rings’ motion picture trilogy, in a special fold-out collectable booklet. Crafted by Sacha Lees at Weta Workshop - one of the team nominated for three Academy Awards and winner of two prestigious BAFTA Awards - these limited edition Stamp Booklets represent a wonderful opportunity to commemorate their amazing cinematic achievement. WE WILL ALSO be offering occasional ‘The Lord of the Rings’ First Day Cover Miniature Sheets, Presentation Packs and Maximum Postcards - please check our regular auctions or contact us for details. As these limited edition Stamp Booklets were only marketed and sold in New Zealand Post shops, supply is strictly limited - don’t delay too long or you may be disappointed. AS A BONUS, your Stamp Booklet will be mailed using additional ‘Lord of the Rings’ gummed stamps on the outer envelope, and will be accompanied by a full-colour New Zealand Post leaflet containing extensive background information on both this exciting stamp release and the epic productions they honour. We also offer a discount when you are the winning bidder on several of our auctions - you may also qualify for FREE* shipping too. 40c stamp design: Walking in the garden of Isengard, the wizard Gandalf the Grey (Sir Ian McKellen) informs Saruman the White (Christopher Lee) that the unthinkable has occurred - the long lost Ruling Ring of the Dark Lord has been found, unaware that Saruman has gone over to the side of Sauron and also seeks it. 90c stamp design: Frodo Baggins (Elijah Woods) - The Ringbearer, accompanied by old friend Samwise ‘Sam’ Gamgee (Sean Astin) enjoy an ale in the Inn of the Prancing Pony, while nervously awaiting the arrival of Gandalf. 80c stamp design: Galadriel (Cate Blanchett), the mysterious Lady of the Golden Wood, Queen of Lorien, also known as The White Lady. Although offered the One Ring by Frodo, she refused knowing too well its power to corrupt even the pure at heart. $1.30 Stamp design: The Guardian of Rivendell stands guard over Frodo who lies asleep, having been near fatally wounded by a Morgul knife while escaping the pursuing Ringwraiths. $1.50 Stamp design: One of the secretive band of Rangers who roam the wild lands, Strider (Viggo Mortensen) watches the hobbits from the shadows of the Inn of the Prancing Pony. He’s later revealed to be Aragorn - heir to Gondor’s throne. $2.00 Stamp design: Boromir of Gondor (Sean Bean) blows the ancient Horn of his people to warn of a raiding party of savage Uruk-Hai. He fell defending Pippin and Merry, shortly after Frodo left the Fellowship at Amon Hen to strike out for Mordor alone. Additional Info: front cover of booklet features Gandalf having plucked the One Ring out of the fire to determine if it is the one true Ring. The rear cover (shown above right) depicts a scene with The Fellowship floating down the Anduin River with background details about the making of the motion picture trilogy. Notice that the self-adhesive stamps themselves are slightly smaller (26 x 37 mm; 1 x 1 1/2 inch) than the corresponding gummed stamps (25 x 50 mm; 1 x 2 inch), and a different aspect ratio - as a result they're more fully framed. 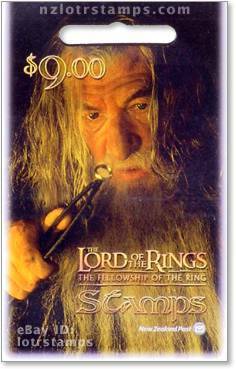 This Stamp Booklet like the rest of the 2001 Official ‘The Fellowship of the Ring’ issue was only marketed in New Zealand and available for a limited time. Additional Stamp Booklets were released to coincide with ‘The Two Towers’ and ‘The Return of the King’. All images, logos and trademarks are the property of their respective owners. Portions of the HTML code and text contained herein this webpage are copyright 1999, 2001 - 2017 Agitprop Associates and are protected under United States and International copyright laws, conventions and agreements. All rights reserved. This website is not affiliated with New Zealand Post, Weta Workshop, or any other organization herein mentioned.